The I-94 Arrival/Departure Record, also known as Form I-94, confirms that a foreign visitor has been lawfully admitted (or paroled) into the United States. It also includes information about the visitor’s visa status and permitted duration of stay. U.S. Customs and Border Protection (CBP) issues Form I-94 when travelers enter the United States. All persons entering the United States need an Form I-94 except U.S. citizens, lawful permanent residents (green card holders), returning resident aliens (SB-1 visa holders), and most Canadian citizens visiting or in transit. CBP issues the I-94 to air and sea travelers during the admission process at the port of entry. The visitor must exit the U.S. on or before the departure date on the I-94 arrival/departure record. In most cases, CBP generates the I-94 record electronically, but may issue a paper Form I-94 in some situations. Since May 2013 Customs and Border Protection began issuing an electronic I-94 record. 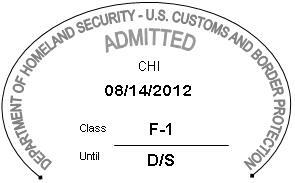 Every time a foreign visitor enters the United States, CBP generates an electronic I-94 arrival/departure record. However, the electronic I-94 number is not be known to the traveler. 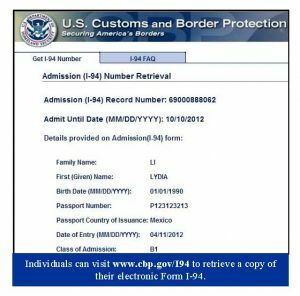 Travelers must go to CBP’s I-94 Website to obtain the electronic I-94 arrival/departure record similar to the sample below. 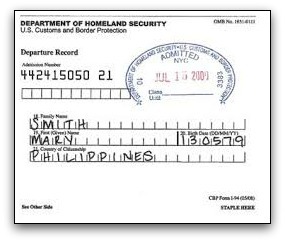 Prior to May 2013, all foreign visitors received a paper I-94 arrival/departure record much like the sample below. However, CBP continues to issue paper I-94 records in certain situations. Since electronic I-94 arrival/departure records are only issued at air and sea ports of entry, a paper Form I-94 is still issued at the land border ports of entry. CBP also continues to provide a paper Form I-94 to certain classes of aliens, such as refugees, certain asylees and parolees, and whenever CBP determines the issuance of a paper form is appropriate.